The Rumble Run Is Live! hearthstone The Rumble Run Is Live! 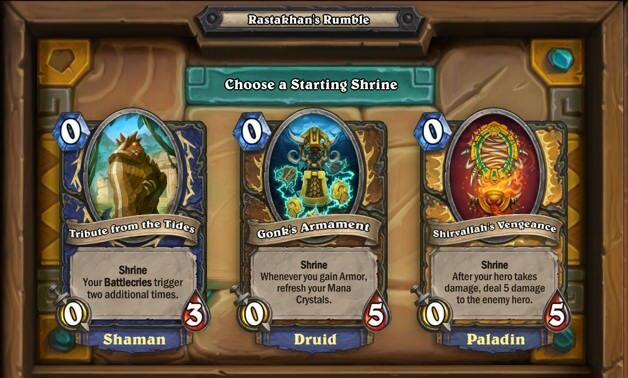 The single-player adventure, introduced along with the Rastakhan's Rumble expansion, is now available in all regions. 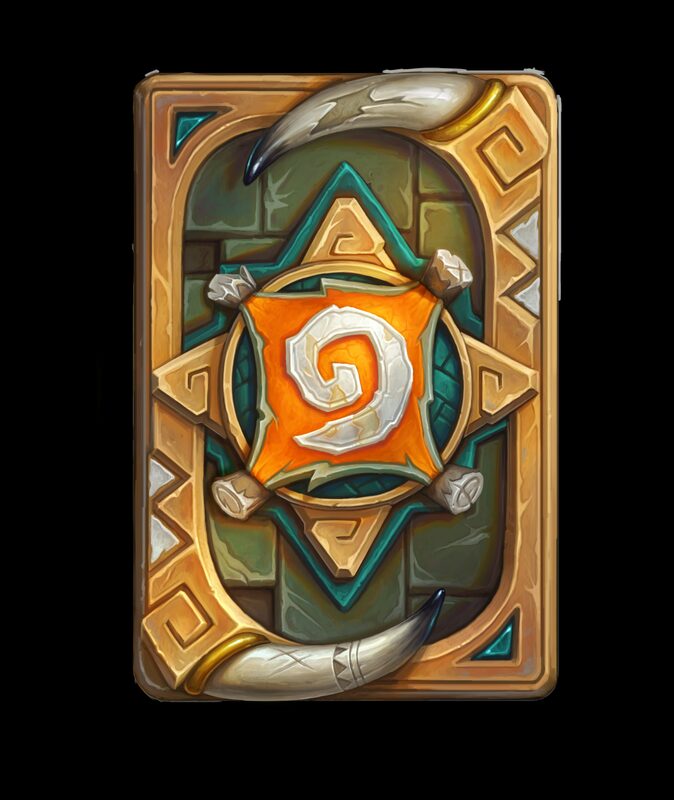 The Rumble Run is very similar to the Dungeon Run and the Monster Hunt, in the sense that you will face eight opponents and you will build your deck as you progress using card bundles, passives and powerful minions exclusive to this game mode. Your hero will always be Rikkar, a young Troll champion eager to prove himself. In the beginning of your run, you will be offered three different Shrines (more on them in the next paragraph) from three different classes. This initial decision basically equals to you picking a Class for this run. The other eight classes will be your opponents. Shrines exist as minions on the board and they have powerful effects. Each class has three different Shrines and each starting Shrine comes with a complementary deck of 10 minions that synergise with it. When a Shrine dies, it goes dormant for 3 turns and its effect isn't active until it comes back to life. Subsequently, you will build your deck using card bundles, neutral passive abilities and class-specific minions exclusive to the Rumble Run. 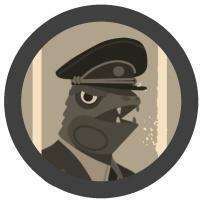 Good luck on this new adventure and we'll soon have a detailed guide on it! i found this yesterday when a log in... it was a surprise! (a good one). I only play it once, using a rogue, I was able to beat the 8 bosses. Shrine: 0/5 every time you cast a spell, cast it again in the same target. If you have more than one Shrine the efect will NOT repeat. There a "upgrade" to your shrine that let you "start with a copy of your shrine" that is a spell, so you start with 3 shrine instead of one. The copied spells arent count as spell cast. (so, Gadgetzan Auctioneer will only draw a card for each). The Counterfeit Coin will give you 2 mana. Backstab will hit 2 time (it doesn't matter that the target not longer apply to the card rules). That's all I can remeber. Did it 2nd try with the paladin shrine that shoots 5 dmg to the enemys face when you take dmg. Success with druid shrine "Gonk's Mark" (after you summon a minion, give it +1/+1). Mostly chose the "Saplings" card bucket for mass treants. The shrine upgrade was "Wrath of the Loas" (Your Shrines have "Deathrattle: Destory all enemy Shrines.") Seventh boss (Armor Warrior) didnt make any attempt to destroy my shrine, even though he had multiple chances to do so - not even when his own shrine was inactive anyway. Eighth boss (Deathrattle Priest) didn't bother too much trying to kill it, at least much less than every other boss before, when the shrine didnt have the deathrattle. Mh, I am a little disappointed. No reward for completing it is kind of poor. Why not a legendary card? Or at least 3 packs? The run itself (did it with druid) seemed kind of easy, the shrine is extrmly strong. And since the enemy has no incredible strong hero power and plays with "normal" cards winning was easy. I was lucky with the (imo great) pick of the minion, that costs 0, has 2/1, automatically starts in your hand and gives 2 manacrystal on death: Awesome. You start with +1 card (this card), you can play it on turn 1 (0 mana!!) and it becomes a 3/2 on turn 1. If you have a 1-drop you get a 3/2 and a 2/2 or someting like that. On turn 1. -> Very strong, you will probably be able to take the enemy totem out at turn 2. And after your 3/2 dies it'll give you 2 mana crystals. But why the *filtered* can't I choose which class I want to play?? How stupid is this? If I want to play a specific class I have to restart the run several times? That is ridicilous. RNG that is that big that you can't even decide you want to play Mage? "No, you are not allowed to play mage. Play Warrior. Or restart this challenge 5 times until I am kind enough to offer you the hero you want to play. And if you fail in your run and want to try the same hero (shrine) again? Well, your problem, not mine. You know the drill, just restart the challenge a few more times." Seriously, isn't there a single one at Blizzard that acutally PLAYS what they program? If they do they should reailze in 5 seconds that the "you can't choose which hero you want to play" is a bad joke. I still do not like the RNG at the beginning. I'd like to choose which hero / shrine I want to play, because shrines differ a lot. BUT: The shrines are very interesting. I tried two more shrines and I enjoyed it a lot. The Priest shrine (healing the enemy deals damage instead) slaughtered me in one game. The more HP a shrine has, the more difficult IMO. And the priest healing shrine has 8 hp, which is heavy.